As star vegetable of the month, I give you the leek. Easter Sunday falls on April 12th this year. Here in France, baskets of candy and chocolates will be delivered early in the morning by a flying bell. What? . . . No rabbit? Nope, only in the Alsace region, which borders Germany, does the bunny venture into the garden. In the rest of the France it is a winged bell that does the delivery. 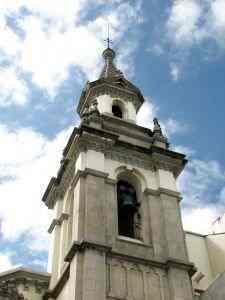 Many centuries ago the Catholic authorities ordered that church bells fall silent between the Thursday before Easter and Easter itself. Children are told that that the bells have flown to Rome to see the Pope and gather candy, returning on Sunday morning to drop chocolate chickens, bunnies, and eggs from the sky. Like many places in the world, eggs are an important part of Easter in France. 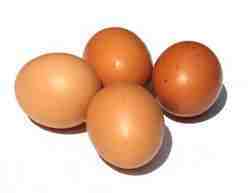 It is said that eggs are symbolic of the return to plenty after the hardship of Lent. Many families organize an Easter egg hunt in the garden and afterwards the children will roll their eggs down a slope to see whose is the fastest. The day after Easter is referred to as Easter Monday and it is an official holiday. Many people take advantage of the hopefully beautiful weather and organize a picnic on this day. In some places there is quite a tradition of making and eating omelets on these picnics, and in Bessières a giant omelet containing 10,000 eggs is cooked in a pan measuring nearly 12 feet across! Enough to offer everyone present a tasty lunch. There really are no traditional Easter dishes in France, but lamb is often cooked. Many people will prepare a gigot d'agneau (leg of lamb) or perhaps, weather permitting, enjoy their first barbecue of the year with les brochettes d'agneau (skewered lamb). If you too would like to enjoy lamb on Easter Sunday, I highly recommend this French lamb stew recipe called Navarin. It is ideally prepared with spring vegetables, making it the perfect dish for the occasion. Here's a bit of French fun that you might like to try out for April Fools Day this year. French school children draw and cut out paper fish and try to tape them on the backs of unsuspecting friends, parents, and teachers. While the adults sometimes play more elaborate bluffs on each other, les poissons d'avril keep the kids entertained all day long. Chocolates, in the form of a fish, are popular treats on April 1st and lots of parents extend the fish theme into the evening and, riding the wave of enthusiasm, serve their wee ones fish for dinner. Butter a baking dish with 1 tablespoon butter and sprinkle with half of the shallots. Sprinkle the fish with salt and pepper, then roll up each filet. Arrange them seam-side down in the baking dish. Sprinkle with remaining shallots, bread crumbs, and herbs, then pour wine and cream on top. Melt the other two tablespoons of butter and drizzle on top. Bake at 400°F for 20 minutes. Serve hot. 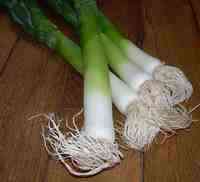 This month's star vegetable is the leek. Leeks are large mild green onions that add mellow flavor to just about anything. Learn more about leeks here: leek recipes. You probably know this potato leek soup recipe as Vichysoise, the famous cold soup. It really is a great way to enjoy leeks. By the way, if the idea of cold soup doesn't rock your boat, just heat it up and call it Potage Parmentier. It's delicious. Leek tart recipe - Featuring tapenade and goat cheese as well. This would be perfect for an Easter Monday picnic outing. Flamiche - A substantial leek tart that comes from the Picardy region of France. I serve this with a salad for a meal unto itself. Videos - I am really pleased to be bringing you my first video production this month. Check out this baked zucchini recipe and expect to see more (and better - I'm learning quickly) videos soon. French celebrations - Here's a list of French celebrations to keep you partying throughout the year. Canneles Bordelais - These are unusual and scrumptious rum cakes from Bordeaux. Sure to please! Seafood Casserole - My husband said this was the best thing I ever made. I didn't tell him it was dead easy. Madeleine pan - Essential for making France's famous teacake. Stainless steel food mill - A versatile and very handy kitchen tool. Oil and vinegar cruets - For those of you who need a little encouragement to eat your salad. Hope you enjoyed your Easter in France. Thanks so much for spending some time with me. In the next issue, due out on April 21st: A French barbecue to get the season started in style.. If you're receiving this newsletter because a friend forwarded it to you, you can sign up for your own copy of La Marmite: Subscribe to La Marmite. A bientot and remember to enjoy your food!